Making one of those 'my top five' lists on facebook today brought to mind a favorite cartoon when I was a kid that seems to be a pretty obscure one. More often than I expect, when I mention it to friends, I find out they don't remember it. For some reason, I remember loving "Kimba The White Lion" and even have this hazy memory of getting up very early in the morning just so I could watch it before going to kindergarten. Whether that's a real memory or something I've somehow made up in my mind, I'm not sure. (The thought of me getting up early for anything seems like a stretch as it is...) The basic theme of the show is that humans and animals have to understand each other in order to get along. Beyond that, I really didn't remember much about it, except how excited I would get from the theme song. A search on YouTube quickly brought up that theme song, but a bit of googling brought up tons of info about Kimba that I never knew. For one thing, the background story that sets up the series is really complicated (I won't even bother to try to summarize, but click the link below for it). 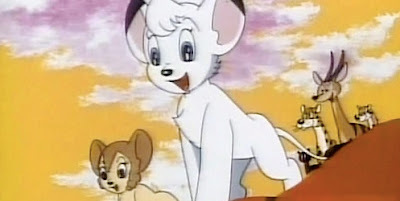 Beyond that, I also discovered all kinds of trivia about how it came about, how NBC sanitized creator Osamu Tezuka's concept, the sequel series of Kimba as an adult that NBC refused and never aired in the US until CBN bought and aired it in 1984, and controversies ranging from the Lion King to modern remakes of Kimba. The links below are to some extremely comprehensive websites about all of that. If I'm not the only one who remembers this show or if you're just curious, check em out.